Safari Valley basically consisted of 4 residential blocks namely Ali, Umer, Usman and Abu Bakar, named after 4 Caliphs of Muslim History. The central area of Safari Valley surrounded by these residential blocks is called Hub Commercial, which is the biggest commercial area of Phase 8 and the head office of Bahria Town is also located there. Map of Safari Valley is attached below; the image is small but it gives you idea of the location of each block. The area spans over more than 3000 kanals of land with more than 8000 residential plots. Out of these 4 residnetial blocks, only Ali block offers 5 marla residential plots, while others offer 7 marla residential plots except USMAN D block which offers 1 kanal residential plots. Bahria Town has also planned small commercial areas, Masjids, play grounds and family parks in each block. Dr. AQ Khan School, Hospital and Rafi Cricket Stadium are also situated in the HUB Commercial of Safari Valley. There are also some more blocks which are considered to be part of Safari Valley i.e. Eden Lake View Block, Rafi Block, Khalid block and Awais Qarni block but these blocks are slightly different from actual Safari Valley blocks in terms of planning, plot sizes and prices. Other developments in this specific area are Safari Homes and Awami Villas which are unique housing projects by Bahria Town. Since it is the only cheaper developed area in Bahria Town with all facilities available, it is the choice of a large number of people looking for residence in Bahria Town. Almost 50% of houses have been constructed so far and people are living there, whereas many houses are under construction in all blocks by general public as well as builders/investors. Plot prices have increased over the past 3 years by more than double due to the ever increasing demand of plots in Safari Valley. Recent slump in property market has hit prices here as well, but still this market is active and good location plots are selling at high price. 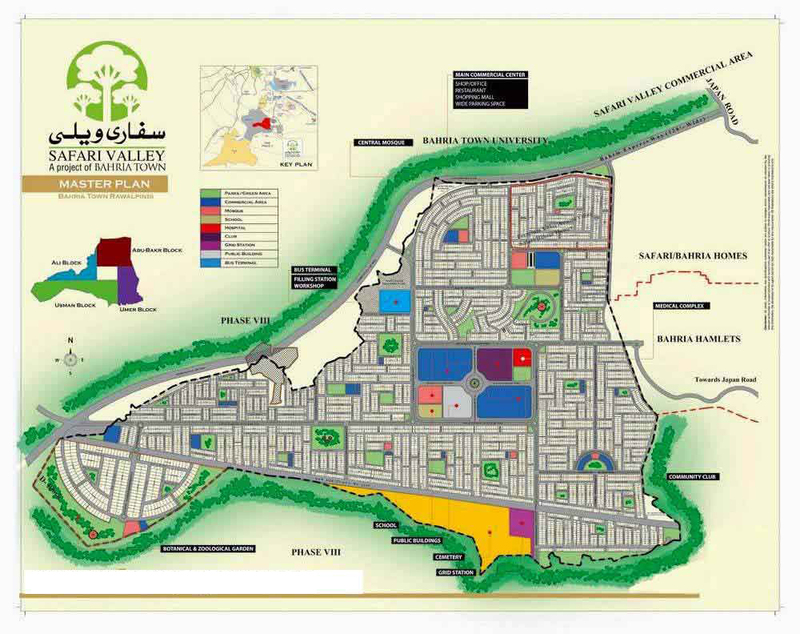 Abu Bakar is considered to be the most populated and expensive block of Safari Valley, which is also the largest block and lies adjacent to Awami Villas. Ali, Umer and Usman blocks are less populated and a bit cheaper than Abu Bakar block, but much of construction work is also going on in these three blocks. Prices of 7 marla residential plots range from 30 lacs up to 45+ lacs depending on blocks, plot location, plot category, paid charges (i.e. category charges, utility charges, map charges, possession charges) etc and 5 marla plots in Ali block range from 20 lacs up to 30+ lacs depending on plot location, category, and paid charges. A village consisting of few houses lie next to ali block which decreases the value of plots lying close to the village. Usman D block has 50×100 size residential plots which cost from 65 lacs up to 80+ lacs depending on location, category and paid charges. The area close to hi-tension wires which passes along usman and umer blocks is the cheapest one, and mostly people do not prefer to buy plots close to this area due to risks associated with hi-tension wires. If you are looking to buy something for residence in Bahria Town, we recommend Safari Valley as the best choice for your future residence where you will have all amenities like water, electricity, gas, school, hospital, commercial area, parks, play grounds and Masjids. Even if your purpose is investment, we recommend Umer & Usman blocks as ideal investment opportunities due to comparatively lower prices and ideal locations with increasing population. If you need further information on Safari Valley, feel free to contact us for free consultancy.